I love jacks and so does just about everyone else who fishes light tackle on the flats. Pound for pound there's almost nothing stronger that swims in the ocean. The one in this photo, caught by Mike Kitz from Ohio, was only a five pounder but nearly spooled the Shimano reel loaded with 15# Power Pro braid. We were just pulling away from Seven Seas Bait & Tackle when a big school of these guys started blasting minnows right off their dock. We chased them around for 20 minutes and this was the second jack that Mike landed just a few yards from the shoreline. These fish are a common sight around the bridge this time of year but you have to be ready when their feeding frenzy starts. Watch for the birds to start diving and toss anything you've got into the center of the action. Just make sure your drag is cranked down since even a small jack like this one (they easily grow over 30lbs.) is enough to dump most smaller reels. The third cold front of February throwing rain against my window right now. That means another three days of chilly temps and we might even hit the upper 30's by Friday morning. At least the reds and snook are making a big comeback on the flats and we're getting shots at them my the dozens each morning. We'll be back in the 80's by the weekend and March is right around the corner. The best fishing of the year is on the way. Sorry Boston. At least you have that new Lombardi Trophy to keep you warm. Thank God that February is a short month. It looks like we're in for another cold snap later this week and that will keep our water temps down in the low 60's at best. It's not the end of the world but a lot of bigger fish aren't having anything to do with it these days. I can't complain about too much about the trout fishing though, and we've even managed to pull in some really nice ones in the afternoons. The clear waters in the north part of Pine Island Sound have produced a few gators last week, especially in the potholes near Orange Pass. You're looking at it. A 3" Gulp Shrimp in New Penny color rigged on a 4/0 Owner's weighted Twist Lock hook. This is my go-to artificial for pulling big reds out of the mangroves, and it catches just about everything else, too. Now that January is behind us we should start seeing more upper slot fish like the one in the photo. March can't get here quick enough, though. My buddy Tyler with a nice sheepshead on fly. We'll talk about that shirt he's wearing in another article. Every serious saltwater fly angler, no matter where they fish, has at least three or four crab flies in their box. For those of us here on Pine Island, that number should be much higher. Every gamefish that swims in our waters makes crabs a big part of their diet, and they have dozens of species to choose from out there. Trying to tie or purchase enough imitations of all the different clawed creatures that inhabit our grass beds would be an almost impossible task, but fortunately you don’t even have to come close to that. In fact just one pattern, with a few small adjustments, will do it all. Legendary angler Del Brown’s classic Merkin Crab fly has been around for thirty years now and although it was originally designed the fool the notoriously difficult permit down in the Keys, it works on every other inshore species, too. Tarpon, redfish, and even snook will hit this pattern and it can be tied in an endless variety of sizes and colors. Since the Merkin is basically a few strands of rug yarn and a couple of feathers, it’s obviously not too hard to modify. You can eliminate the weights to make it a surface pattern for tarpon in the passes or tie on some extra heavy dumbbell eyes to dredge up grouper from the near shore reefs. The Merkin was such a revolutionary pattern that almost every “new” crab fly introduced over the last few decades has been nothing more than a tweaking of Del’s original masterpiece. There have been several well publicized attempts to reinvent the permit fly recently but all of them still share 90% of their DNA with Del’s original masterpiece. One thing I really like seeing is anglers modifying it specifically to fool sheepshead. These are one of the most common but sadly underrated inshore gamefish on the entire east coast of the United States. Sheepshead are difficult enough to catch on live bait since their entire diet consists of barnacles that they eat off of dock pilings and oyster bars. Fooling them with a fly is a serious chore but, like a lot of other species, they can’t resist a good looking crab. 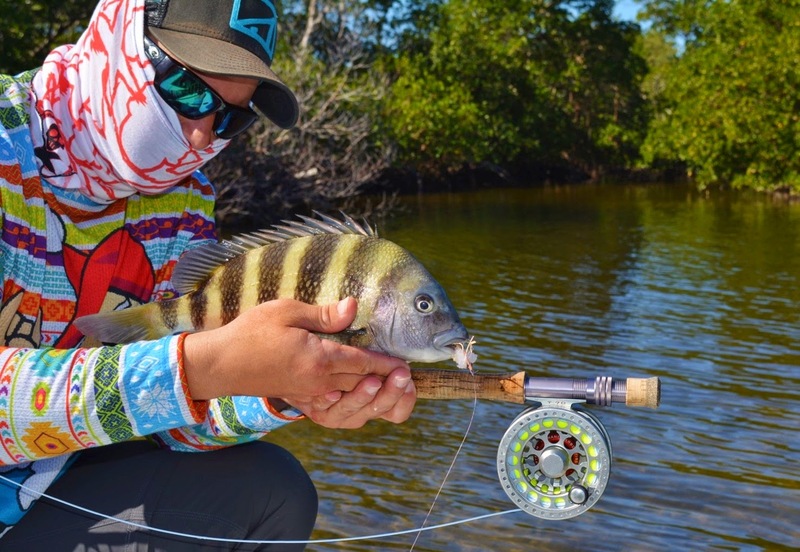 Catching a big sheepshead on a fly rod is just as much as of an angling accomplishment as landing a permit in the Keys. Fortunately for us here on Pine Island, it can be done year round. Learning where the neighborhood oyster bars are located is the first step to hooking a sheepshead. Now that we’re in the winter low tides this shouldn’t be too difficult. These huge clumps of oysters are poking way out of the water just about every day this month. Mark them on your GPS and charts because it’s during the high tides when you want to be out there fishing. That’s when the sheepshead most actively feed along the oyster bar’s edges. Cast and bounce a #4 or smaller Merkin, or similar crab pattern, off the deepest part of these bars and you’re most likely to get a very subtle bite from a sheepie. Just remember to pull straight back with your line hand to set the hook on them. The sheepshead’s mouths are solid teeth over even more solid bone so lifting the rod tip like you would on a freshwater trout does next to nothing. Strip strike them like a tarpon or the hook will never bury itself in there. This is just a thumbnail sketch on how to fish for this tricky species with a fly. Even though I rarely target sheepshead on any tackle, I really wish I could dedicate more time in pursuit of them on my charters. 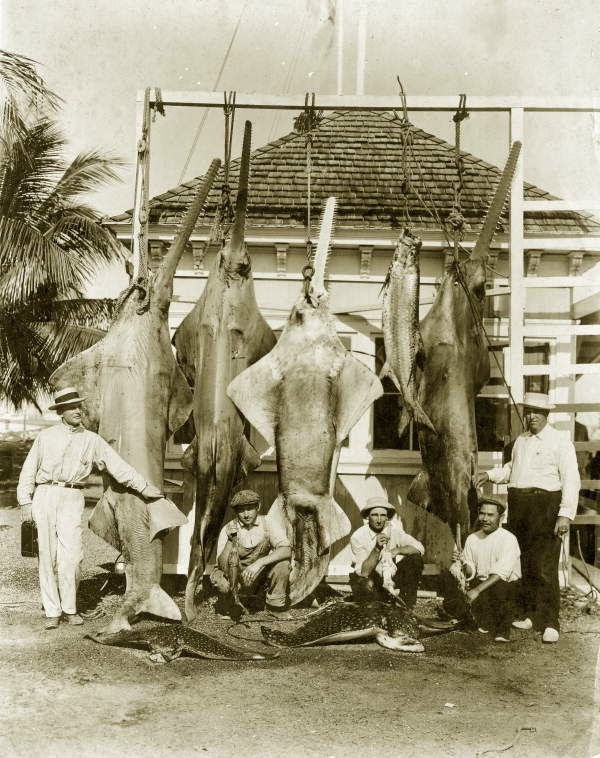 They’re a very worthy adversary and not difficult to find here on the waters around Pine Island. Give the sheepshead a serious shot with some crab flies and let me know if what you’re doing is successful.